I read this article and found it very interesting, thought it might be something for you. 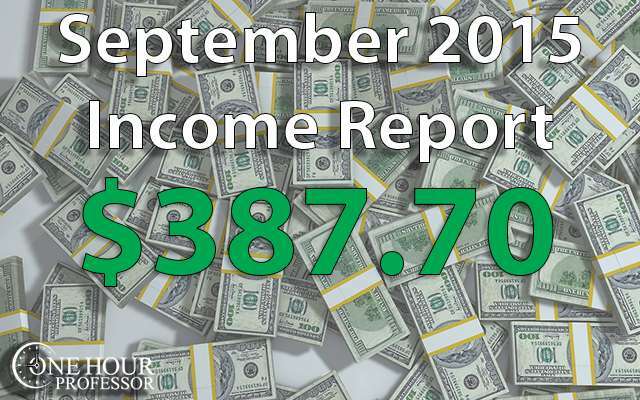 The article is called September 2015 – Monthly Income Report and is located at http://www.onehourprofessor.com/september-2015-monthly-income-report/. Another exciting month and one that was full of investment of both time and money. In fact, this month alone there was 161 hours and 30 minutes put into my online businesses and I couldn’t be happier with the result. Obviously a ton of the time was focused working on my new course which is focused on building a successful authority website, but there was also a significant time investment in my authority website itself as well. If you missed my big reveal, the website is at www.JobsForFelonsHub.com. The revenue for this month was on par with prior months, but my expenses were nearly $1,000 so there wasn’t a ton of income from the month itself. But that’s okay, I think that everything I’m doing now will end up paying off in the near future. This month was dominated by the authority website in terms of time worked. However, you’ll notice that a lot of this was contracted time and this is because I’ve been working on creating databases to rank in Google search. BLOG – INTERVIEW: Matthew Allen from Dumb Passive Income: This was a nice blog post that I released in September and I really liked it because it was very engaging for the OHP audience (20 total comments) and many people seemed to really like it. I plan on doing more of this in the future, but as of right now laser focused on completing this new course. BLOG: August 2015 Income Report: As always, I created income report and there wasn’t much new to this report except for the “income by channel” analysis which made me take a little bit longer than usual to create it. Facebook | Twitter | YouTube | Google +: Next we had the typical social media account which is never a large amount of time. Truth be told, I believe that I’m underestimating my social media management probably by an hour or two because I randomly log into my social media accounts and check things various times throughout the month, but I really don’t want to take the time to track all that. Authority Website – JobsForFelonsHub.com: I had an obscene 62 hours contracted for the authority website last month and I expect that to drop substantially this month. Most of the time contracted was to my virtual assistant holding a database, but I also had someone randomly reach out to me for the website and offer to be a writer. Lucky for me, this individual agreed to a very fair rate per article and has created content that is exceptional. Though I’ve got some additional databases that I want to create for this website, I’m realizing that at this point most of it is outsourced so as long as I have my writer and virtual assistant in place, I shouldn’t have to spend much time working on this at all. At this point in time, I’ve created a database that basically lets me rank on the first page of Google for the top 750 companies in the United States every time that somebody searches “Does [COMPANY NAME] Hire Felons?” That’s where the majority of the contracted time was spent and it’s definitely paying off as I’m seeing my traffic continue to increase day after day. COURSE: Building a Successful Authority Website: The next item is my course that I’m building and frankly, I think that this course is amazing. I’m extremely excited about it because I know that anyone who takes it will get a ton of great information out of it and be able to walk away knowing what it takes to build their first authority website. Most of the contracted work here was to edit video, but I also put in a significant amount of work myself reviewing that video and also producing videos that are screen shares for the course. Though I’ve already mentioned previously, if you’re interested in getting updates (and a discount when the course opens) please sign up here. General Website Maintenance: As always, I had some Gen. website maintenance items related to responding to comments and fixing a few tweaks here and there for the new authority website. Income Breakdown by Main Channel: I’ve decided to add this area in my income reports because I want to be able to reference how much I make on each channel that I have. This makes sense because I anticipate that I will continue to grow and keeping track of this will be important to know what channels are really profitable. Please note, I didn’t include historical data here, I just included data from August 2015 and beyond. Again, my passive income streams didn’t fail to disappoint. Though I made a decent amount of money in consulting, I saw my revenue climb across the board, specifically for my authority website which gets me really excited. Legal Match: This is the service that connects people with lawyers for free. As of now this comes from one blog post I created but I have also included this on my authority website as a resource as well. Google Adsense: Again, I saw a small increase here and even though it was only $23 total, it’s progress. Udemy: I increased my earnings on Udemy primarily because I assigned a price to my most popular course which was previously free. Though this is my lowest income stream, I did see a few sales come in this month and something is better than nothing. Ninja Outreach: This platform has quickly become one of my favorite tools that I use. I talk about it over and over again and that’s because it’s really great software and extremely cheap. I was pleased to see that I made this much from the platform in September and hope that this continues to grow. Long Tail Pro: If you’re already on my email list you know that I sent out an exclusive discount that was being offered for very limited time. I urged everyone to purchase Long Tail Pro not because of the affiliate income that I make, but because I know that it really does work and without it, my search engine traffic would practically be non-existent. I commend those who purchased the tool and urge them to use it to its full extent. In my eyes, it’s the best keyword research tool out there. YouTube Channel: Again my YouTube earnings increased and again I wondered why I don’t spend more time putting videos here. In the future I’m going to try to put a few videos here every week as it seems incredibly easy to rank and I’ve noticed that the income is truly as passive as it gets. Indeed.com: I was expecting over $100 last month from this passive income stream, but unfortunately I just missed it. However, making $85 on an authority website that I just launched a month ago isn’t too shabby. I’m going to go out on a limb this month and say that this revenue source should surpass $150.00. Fingers crossed! Consulting: No new clients this month, just a few older clients asking for random work to be completed. Aweber: I got a little boost from Aweber this month due to somebody who signed up for a month ago. Truth be told, I’d be happy to break even on AWeber each month and know that I’m able to use the software for free, that would be a cool feeling. Expenses this month were really high, but I’m okay with that because I have a lot of things to show for it. Aweber: Even though I made money with this platform, I still have my monthly fee that I have to pay for. Hostgator: This is my recurring hosting fee and this month I had some annoying domain re-registrations fees and such. Hootsuite: Everyone talks about social media and how important it is, but have you taken the time to look in your analytics to see how many email sign-ups or purchases social media is accounting for? In most cases, the answer is none. This is why I use HootSuite. At $10 a month and auto scheduling my posts, it’s well worth it. Here’s a video showing my strategy. Content Production Plugin: Have you ever gotten really sick of people stealing the content from your website by copying and pasting it onto their own? I did, so I decided to try to protect my databases by implementing this plug-in. Basically it makes it so that it’s really difficult for someone to copy and paste the content from your website on to their own. Call Rail: This is the platform that I’ve been using to record my client calls for my consulting gig. Youpreneur with Chris Ducker: I’ll admit it, I got caught up in the moment and signed up for it this new service with Chris Ducker. In a nutshell, it’s a large group of people and a old-school forum that allows everyone to communicate with each other and connect with like-minded people. After 10 days of signing up, I realize that I just don’t have the time to dig around in forms for an hour or two each day to answer questions and ask questions from others. I had it up canceling and will not continue to be a member here. Ahrefs: I did a lot of research and found out that this is the most reliable tool to see what websites are linking to specific articles. This is extremely important for my email outreach efforts and I’ll continue using this tool. Elance.com: My expenses for Elance were outlandish this month. I spent a small fortune getting my database for my authority website correct and also spent a ton on video editors. I think this will all pay off though, it’s just a matter of time. Did I Meet my Goals for September? One of the things that I haven’t been doing enough of lately is writing. I need to write more for the OneHourProfessor.com website, I need to write more for my authority website, and I need to do more guest blogs. I’m going to try to do more writing this month than I ever have before and it should pay off. My goal is to publish 6 blog posts on OHP, 4 blog posts on JFFHUB, and at least 2 guest posts. The only reason why I didn’t meet this goal is that I didn’t think it made sense to blog about my authority website and drive a bunch of people to my website without a lead magnet in place. I am working on a mini course for people and will do my guest blogging once it’s done. I’ve been relying on Udemy to host my courses for some time and although I have over 5,000 students on the platform, about 99% of those are from my free course. While I’m happy that the free course is there and it’s definitely providing me with some exposure, I realize that in order to fully control my own destiny I need to have a course area on the OneHourProfessor.com website. So, this month I want to build out an area of my website that has all of my courses listed. Done! It’s a little sloppy and needs work still, but you can go to http://courses.onehourprofessor.com to see it. I’m actually extremely excited about this one. If you don’t already know, I am creating the authority website based on all of your feedback and after being featured on the 1-day business breakthrough podcast. You all mentioned that you wanted me to create a course that explained how to create a profitable website, how to blog, and basically an all-encompassing course that will walk you through all the steps of getting this done. Well, the authority website experiment was just that, and now I’m going to make this new course into a living and breathing case study for you to follow. It’s going to be really cool because I’ll walk you through everything I did up to this point and will continue to update the course each month with something else. I absolutely crushed this goal. Not only did I start creating the course, I’m about 70% of the way completed with it already! I’m working really hard to get this done for all of you so that you have something to help you with making your own authority websites successful. I’m working hard on it, but by the end of the month I want to be DONE with my authority website course. I am 100% certain I can do this, just can’t get sidetracked. Everyone keeps talking about how effective mini courses are to drive students into a flagship course. Well, I have decided to make one. While some of the content will be pulled directly from my full course, I think this is the right opt-in to offer people now that I have successfully built my authority website. Whether it be creating some YouTube videos, selling more of my current courses, or coming out with a new product quickly, I want to find ways to increase my passive income as well. I’ve actually been following what you have been doing on and off for a bit and your sites are really coming along. What are you using to host your own courses? I too use Udemy to host but eventually, I’d like to host my own courses. I was considering joining youpreneur also but I just don’t have the time to sit in forums either, as valuable as they are. Thanks for commenting, always glad to hear from readers. Thanks for the compliments. Yes, the websites are FINALLY coming along and I think I’m gaining steam, haha. As you know, it’s hard work! As of now I’m using Zenler. It’s a flat 10% fee of every sale, but it’s 100% free to setup and allows for direct importing of Udemy courses, which is what really sold me on it. If you feel so inclined, shoot me a contact message with what you’re working on. Would love to connect and hear more. Keep going, you will be success, trust me. I’m on the way to build my online empires too. Visit me at my website: http://berichandrich.com/. Thanks for commenting and letting me know about your website. I checked it out and love it! Seems like we are really doing a lot of similar tactics. Some good reads there as well. Nice to see how you have been improving each month Ron. It sees JFF is also coming off nicely. My question is have you checked the search volume the “Does [COMPANY NAME] Hire Felons” by using various company names? Also, we had tried Ninja Outreach but didn’t quite like it. What do you like about it? I don’t see how it is useful in search but I do feel that it can be beneficial in keeping tracking of the ongoing (email) conversation one is having with a target client; particularly if more than one team members are working on the same project. Thanks for commenting and the kind words! I did check the search volume for Does [COMPANY NAME] hire felons and the amount of searches per month were all around 50-100. But that’s the beauty of the strategy….because they are all long tailed keywords with lower search volumes, a lot of people didn’t try to rank on most of them. Because I built out around 700 pages with different companies, it is working incredibly well. In fact, this month JFFHUB almost surpassed OHP in traffic….and the website has only been live for 2.5 months!!!! It’s crazy! I like Ninja Outreach for two reasons. 1) Finding guest blog posting opportunities is VERY simple. 2) If you are doing email outreach, specifically trying to share some great content you created with 25-100+ people in a cold email, it is easily saves me 5+ hours of work. THAT page shows you all it can do and if used correctly, it really does work!